Orto di Casa Cecconi: So good and so frustrating! As I said last week everything is tidy and ready to burst into life, and it's so good to look at and enjoy, except it's NOT under control! This is the time of the year when all the gardening chores start to compete for my time, at home and the allotment, and I still have only the weekends to tackle them. 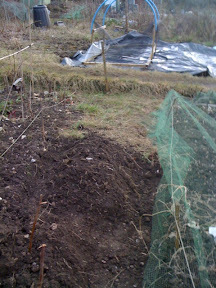 Then at the allotment I only managed to dig half a small bed. My rotation plan tells me that - apart from where I already planted (alliaceae, Jerusalem artichokes & broadbeans, besides soft fruits & asparagus, and last year's leek seedlings that are still apparently growing) and the potato & chilli beds weeded and covered - I currently have no clear beds to plant anything in the ground, so I can only sow in the greenhouse. This is a most inconvenient situation, as you can imagine, as there are at least a couple of vegs that I could sow in the ground now.